Talgo, the veteran company founded in 1942, has awarded GEINSA with the installation of various equipment for the factory in Rivabellosa (Alava), which produces most of the High-speed rail units contracted for Saudi Arabia. 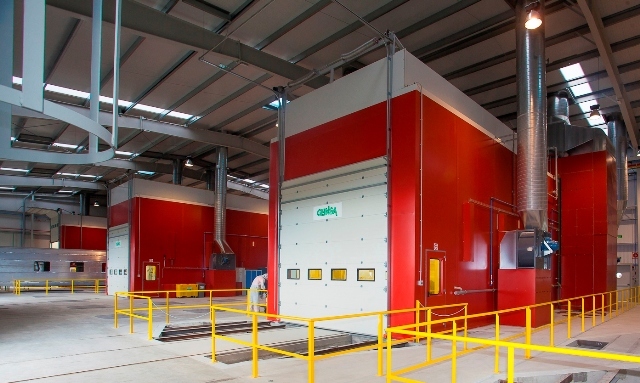 The plant has six paint booths-oven, which in a first phase three were installed, A1, B1 and C1 and a fourth called D in the existing pavilion before the enlargement. The second phase has begin in March 2014, consisting of three more cabins, A2, B2 and C2, installed in parallel to the above. At A1 and A2 booths preparatory, painting and drying operations are carried out; at B1 and B2 booths the plastering is effected and at C1 and C2 sanding, fillering and painting is done. The booths have a size adapted to the train units and are prepared for a possible future expansion.